Here are some of the therapeutic sessions we offer. A selection of these may form part of each child’s individualised program upon recommendation from professional therapists. Rebound therapy uses a trampoline to facilitate movement, to promote balance and sensory integration, to increase or decrease muscle tone, and to improve communication skills and general fitness. Hydrotherapy is a form of therapeutic exercise carried out in a specially heated pool. The heat and buoyancy of the water provide a relaxing medium that assists in stretching out tight muscles. We are a Total Communication school dedicated to ensuring that “no-one is excluded, everyone has a voice and everyone will be the best they can be”. Our aim is to promote safe, respectful and responsible behaviour right across the school community. By responding to behaviour as communication, we are able to provide support for those communicating primarily through their behaviours. We enable students to access and use more socially appropriate methods of communication. Students may be anxious, under stress or emotionally vulnerable and need individual support pathways. These pathways can re-establish, or indeed establish, that interaction with another person can be a positive thing. 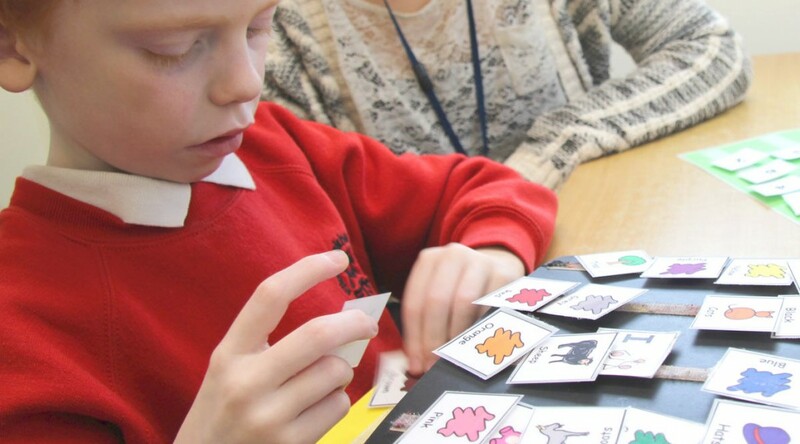 The school is supported by a Speech and Language Therapist and Assistants whose role is to support classes in providing a Total Communication environment in which our students learn. We also provide advice and support for the students to help develop their communication skills. The Speech and Language Therapist works as part of the school’s multi-disciplinary team, alongside the Behaviour Support team, Advocacy Lead, Visual Access Lead, teachers, families, Physiotherapist and Occupational Therapist, to ensure a holistic approach to supporting our students. Every child needs to be heard. Every child has something to say. But how does someone express themselves if they don’t have the words? Through the musical interaction created in Music Therapy, a child can learn how to interact and communicate more effectively, explore their own emotions, be listened to and above all, know that they are being understood. Many children blossom in Music Therapy, finding new confidence, developing ways to express themselves and all using the (easily-accessible) medium of music. Every child should be heard. The advocacy team works in many different ways across the school, adopting a flexible approach to both individual and group sessions. The aim of the advocacy team is to ensure that the voice of the students is being heard and responded to daily, as well as in bigger changes. We support students to have a voice in decisions which affect them and to have an impact on their own lives. We work together regularly to ensure we understand our students’ needs, seeking additional, external support where necessary, to support them to have an impact on their own lives through communication. This will ensure their voice is heard, they can have a say in their own futures and they will be the best they can be. Within the school teaching team is a Visual Access Leader who is additionally qualified in Visual Impairment. The Visual Access Leader will assess functional vision in a variety of environments, set appropriate visual stimulation programmes, advise on access to the curriculum, and provide advice on teaching programmes and individual targets. Within the school environment, pupils with a severe visual impairment have access to the light/darkroom. This is a valuable resource that is used to teach structured visual programmes aimed at developing and maintaining visual skills. In addition, ICT resources are used to deliver structured individualised visual programmes. The school adopts an holistic approach and therefore the Visual Access Leader works collaboratively with the Rehabilitation Officer for Visually Impaired Children, the advisory teacher for VI, the therapy team, the school team and parents.